My friends and I had dinner here afew days ago. The lighting was initially bright but it dimmed when it got abit later. 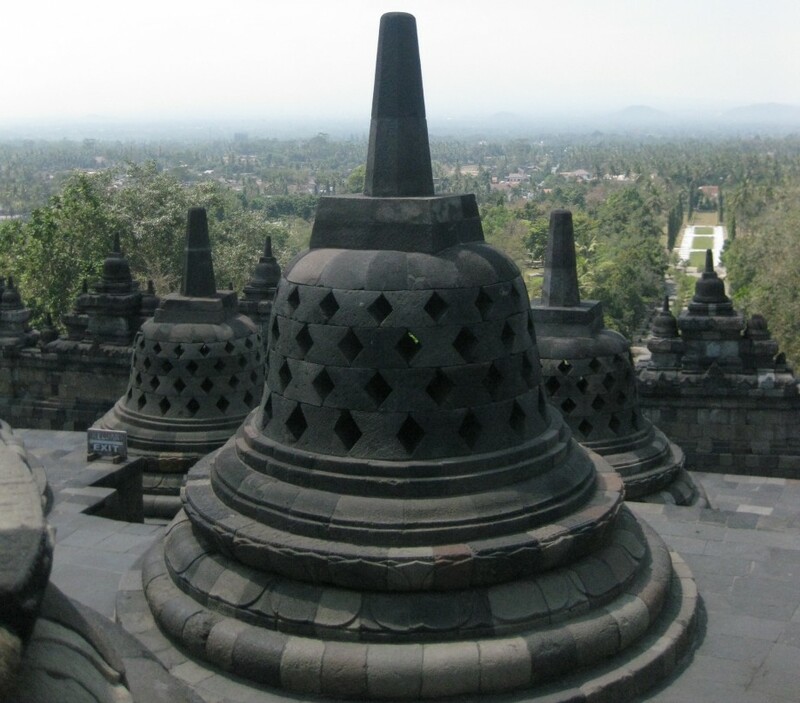 It has two levels so while it may seem small, it’s a fairly large restaurant. Downstairs has a set-up where you could have a private function with leather couches, throw pillows and a private bar so it feels like you’re partying in your own basement. 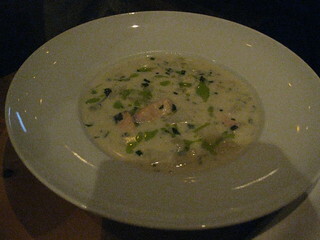 A friend had the salmon chowder with potatoes and chive oil. I had a spoonful and it was quite delicious. 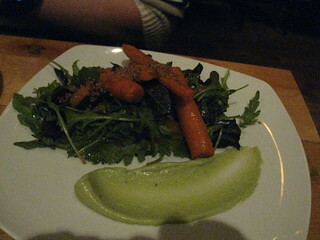 Another friend had the roasted carrot and beets salad with avacado and crispy quinoa. 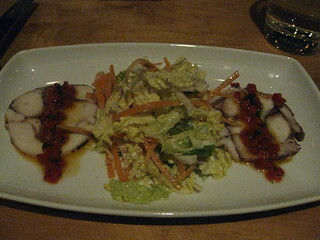 Another friend and I had the octopus terrine with white miso coleslaw. A terrine is sliced food that has been prepared in advanced and given time to cool before serving. 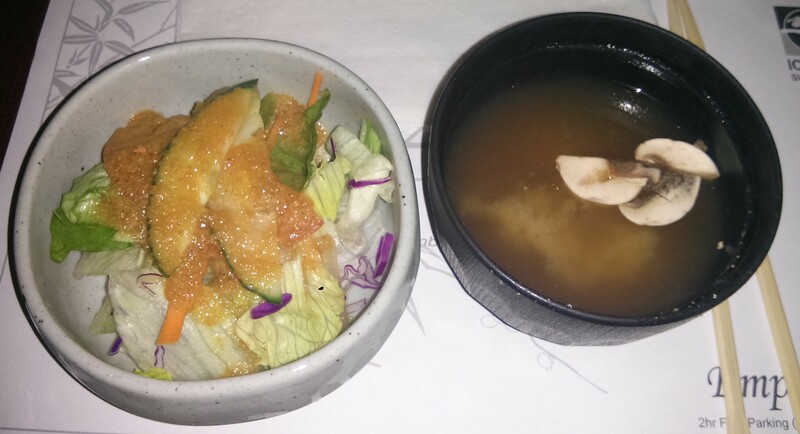 I had expected more octopus slices however the octopus goes well with the white miso coleslaw. 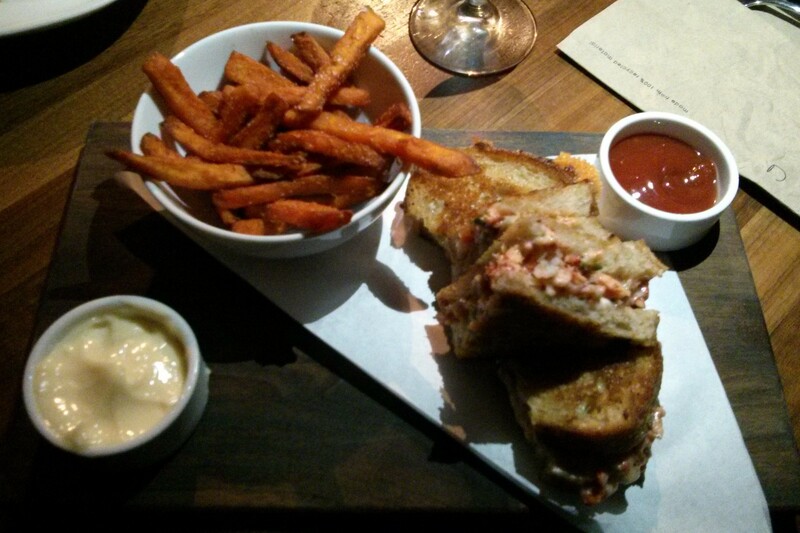 I preferred the octopus escabeche at Parts & Labour compared to the octopus terrine here. 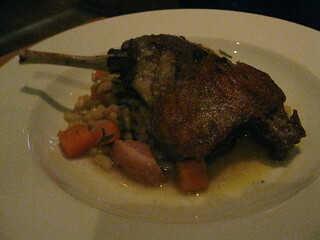 A friend had the duck confit with Perth County smoked bacon and a bean cassoulet. Duck confit is duck leg that’s deep fried slowly at a low temperature. A cassoulet is a stew or casserole that’s slow cooked. 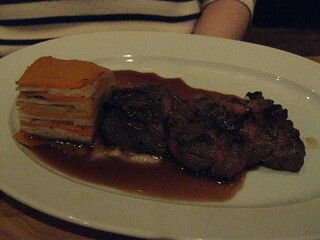 Another friend had the grilled flat iron steak done medium rare with smoked onion puree, red wine jus and root vegetable pave. He felt that the gravy overwhelmed the steak. 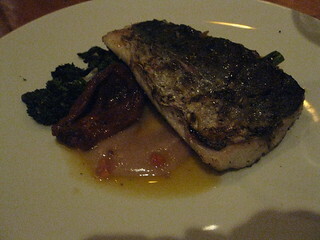 Another friend got the grilled mackerel with charred rapini, roasted tomato, cannellini bean puree and a tomato vinaigrette. 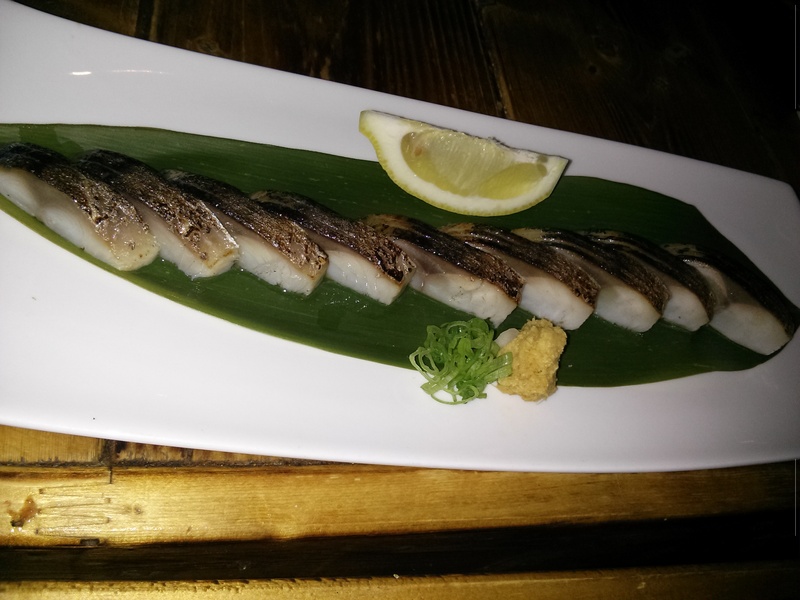 She thought that the mackerel was cooked well and that the meat was fall of the bone, so to speak. 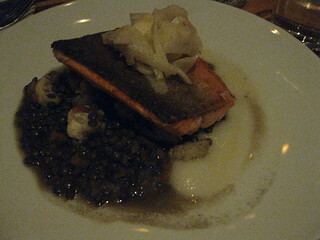 I had the crispy skin arctic char with roasted cauliflower, du Puy lentils and pickled fennel. 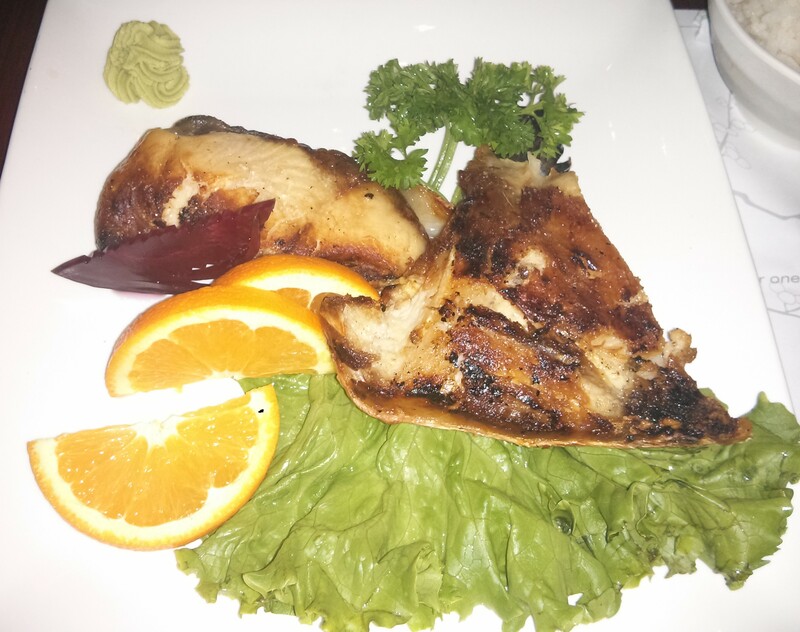 Arctic char is a fish and the taste and texture is similar to salmon. My arctic char had some undercooked to raw parts. 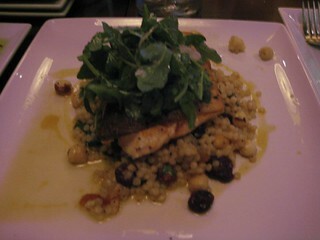 The only other time I had arctic char was in Kitchener at Wildcraft for a friend’s birthday party back in 2012. 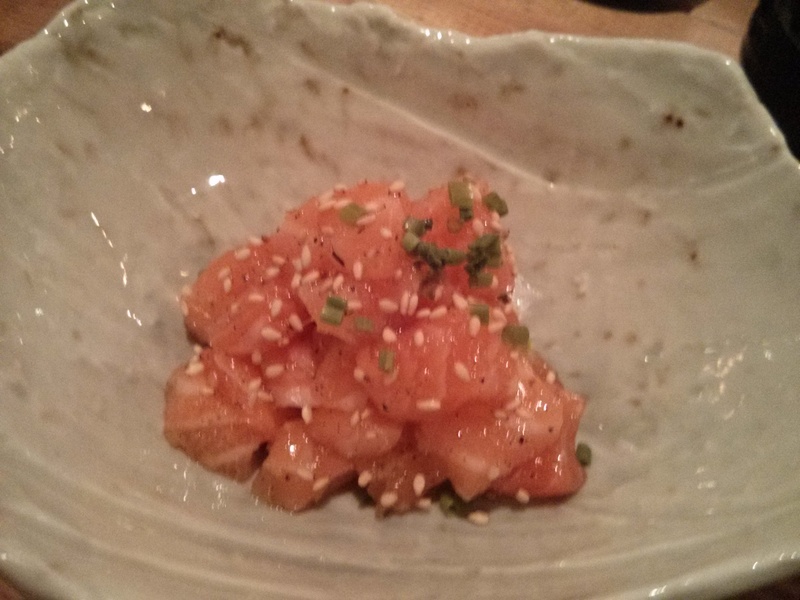 I think I preferred that arctic char compared to the one at Quince since it had sweet, salty and sour elements as opposed to tasting elements of salty, kind of bland and a sour sweetness. For dessert, two of my friends and I shared the butterscotch banana budino, pumpkin almond torta and chocolate bread pudding while another friend just got the butterscotch banana budino.The butterscotch banana budino is topped with whipped cream and sprinkled with toffee crunch. It’s the best dessert of the three. 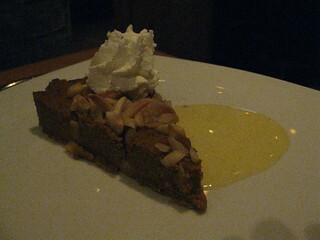 The pumpkin almond torta is accompanied by spekulaas spice, creme anglaise and chantilly cream. 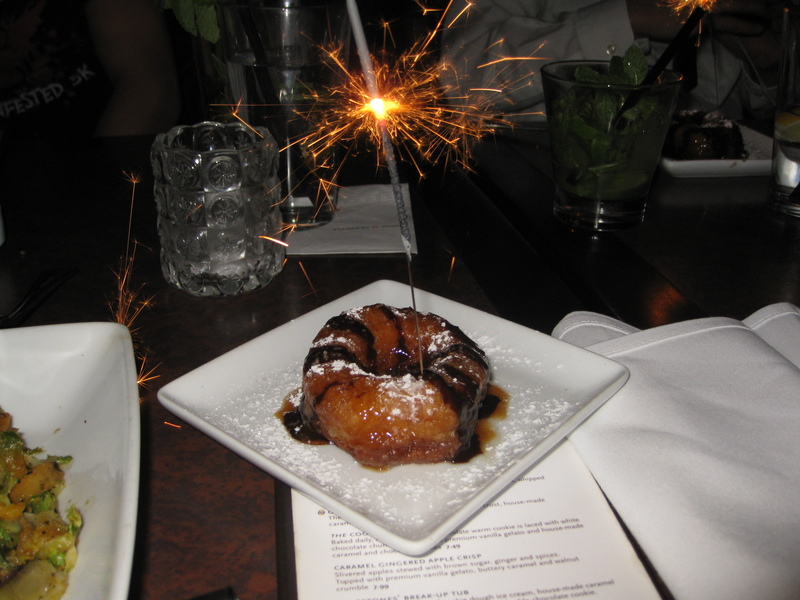 It’s a tasty dessert that’s not too sweet. 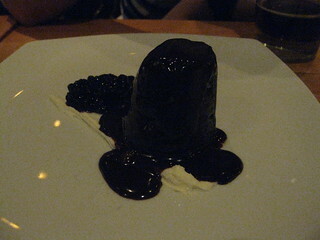 The chocolate bread pudding with a berry compote and honey creme fraiche reminded me a chocolate lava cake but without the molten lava. My friend thought that the berry compote overwhelmed the chocolate bread pudding. 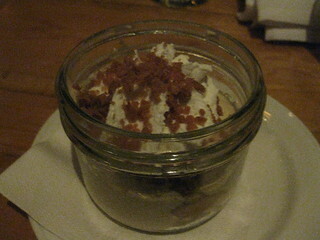 Overall for dessert, the butterscotch banana budino is the tastiest followed by the pumpkin almond torta. I also got B52 coffee while my friend had tea. 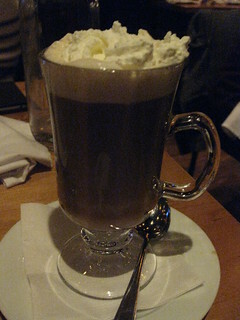 B52 coffee is coffee mixed with several kinds sweet liqueurs. My high school friends and I decided to eat dinner here. 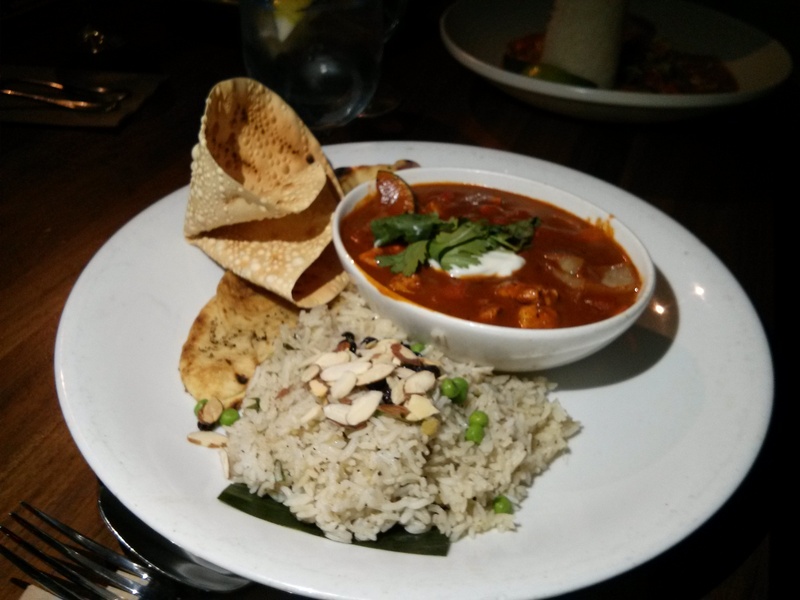 Neither of my high school friends had tried any winterlicious/summerlicious restaurants before so I recommended Five Doors North to them to ensure a good first impression. Service is as impeccable as always. 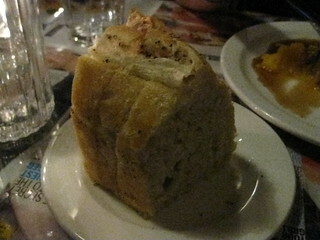 Winterlicious dinner is $25 + tax & tip and you could order rosemary focaccia bread for an extra $1. 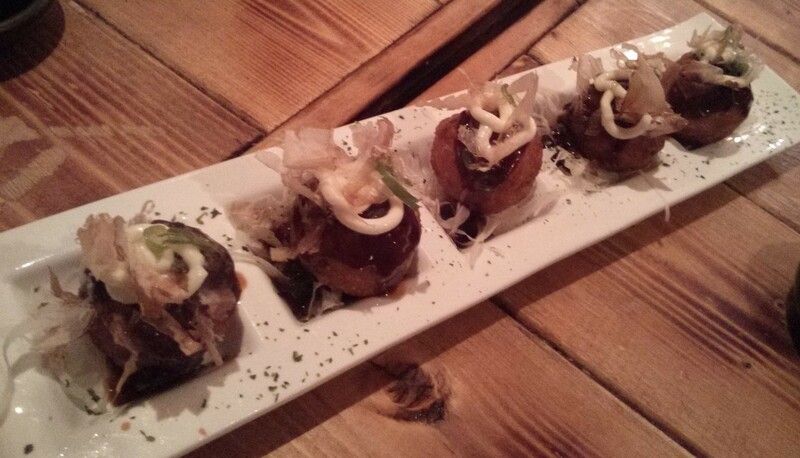 All three of us had the crispy pork belly. 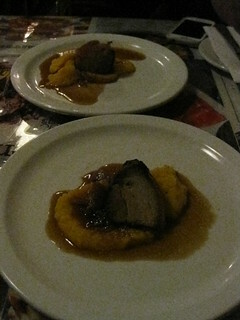 It comes with butternut squash mash and a caramelized apples and sweet onion reduction. 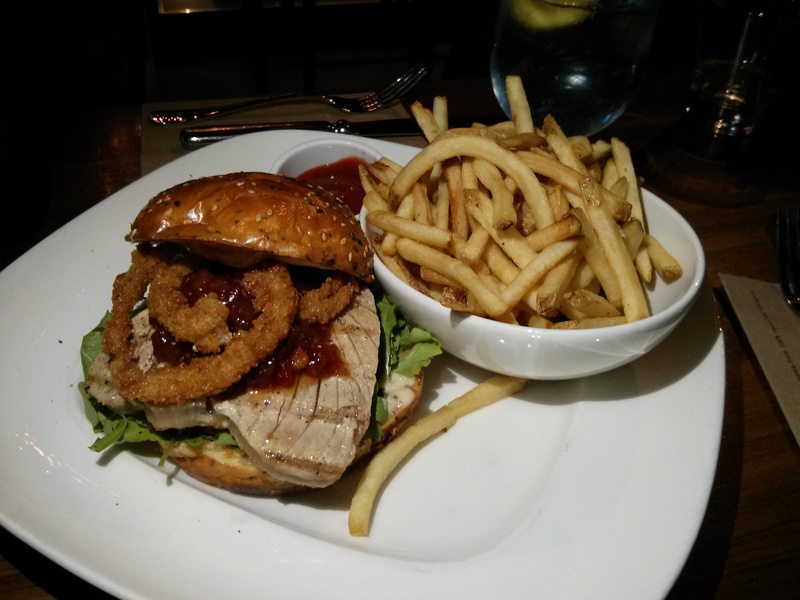 The portion was smaller compared to last year’s crispy pork belly however it was just as scrumptious. 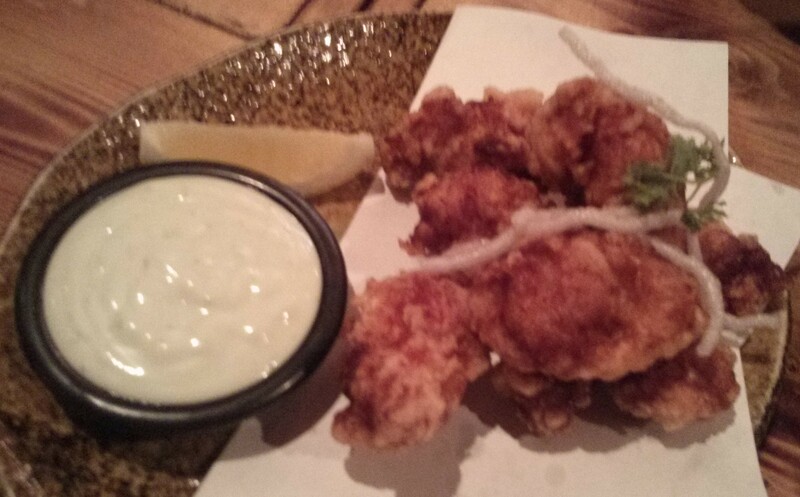 The skin was crispy with a decent layer of fat and melt in your mouth meat. 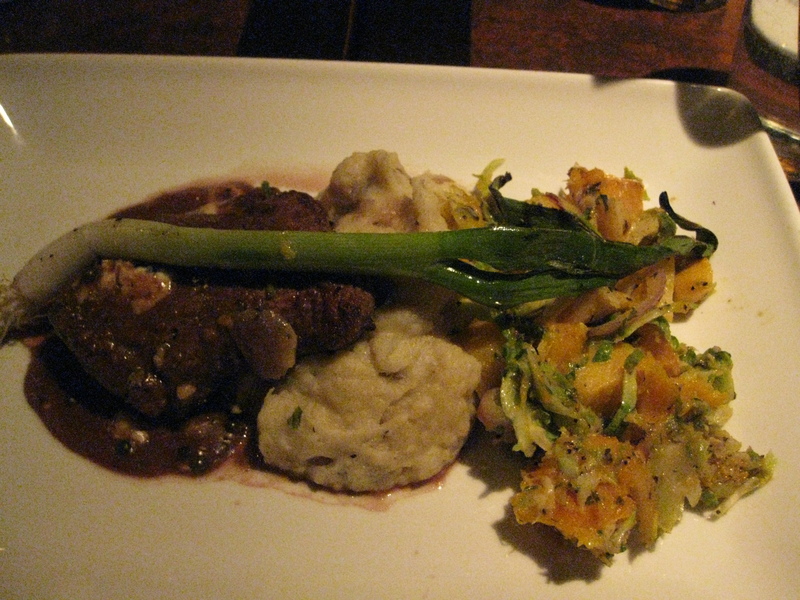 For the main, both of my friends had the pumpkin seed crusted salmon while I got the grilled chimichurri skirt steak. 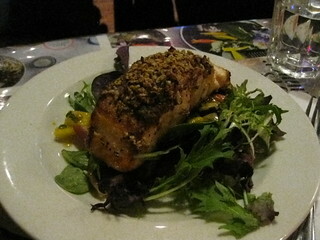 The pumpkin seed crusted salmon comes with mango and smoked red pepper salad. My friends enjoyed it. 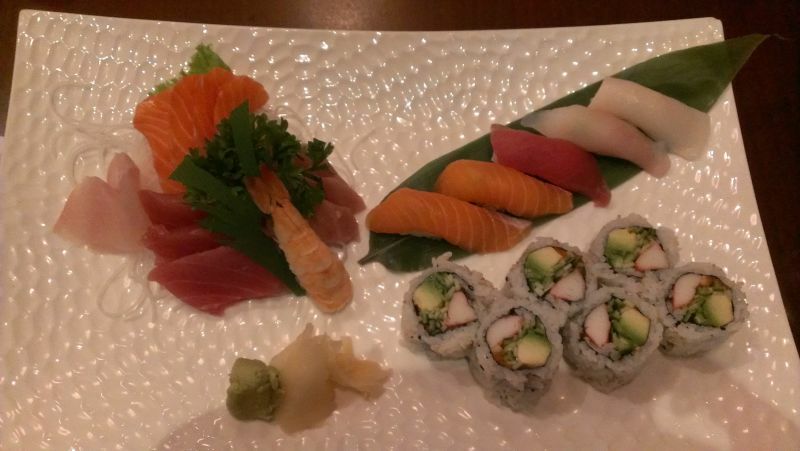 One of them like that the mango was sweet and balanced the salmon well. 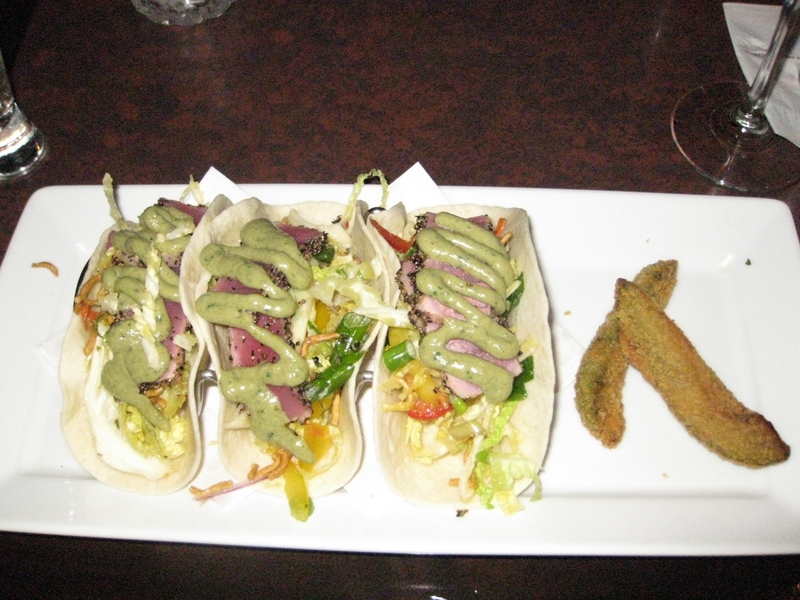 My grilled Ontario chimichurri skirt steak comes with crispy tortilla strips, avocado mousse and black bean sauce along with a tomato and lettuce salad. The skirt steak was slightly tough but done just right at medium rare and the black bean sauce was a good accompaniment to both the salad, crispy tortilla strips and the steak. The tomato and lettuce salad was also tasty on its own. My friends and I decided to split the dessert so we had the flourless chocolate cake, vanilla creme brulee and banana chocolate chip bread pudding. 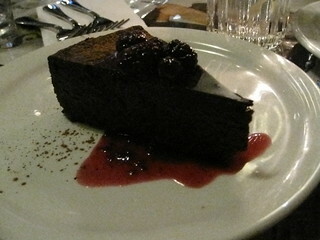 The flourless chocolate cake is made with dark chocolate and topped with blackberries with a blackberry coulis sauce. 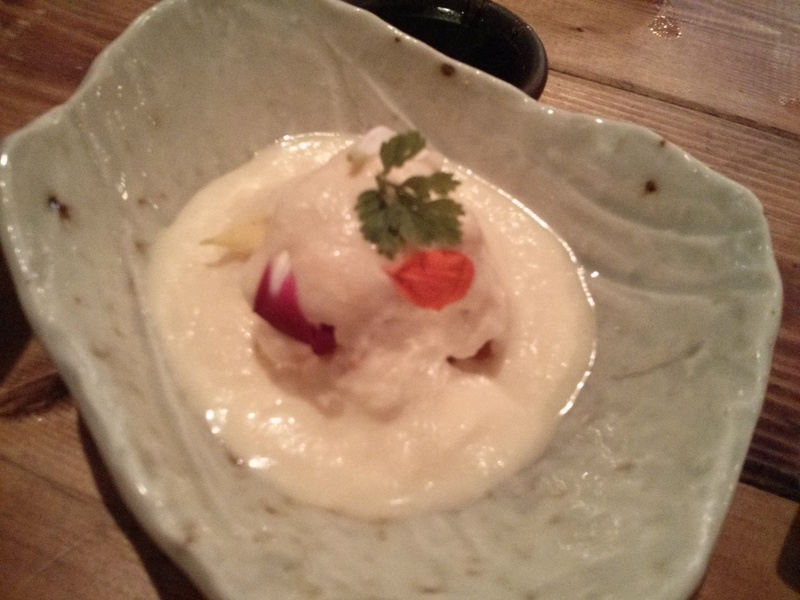 It was very delicious. 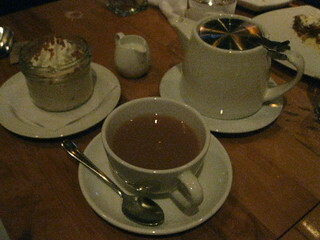 The vanilla creme brulee was as scrumptious as always. 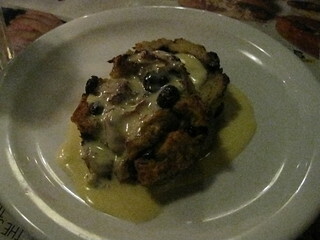 The banana chocolate chip bread pudding comes with bourbon creme anglaise and the pairing is delectable. Overall, I recommend you try this restaurant if you’re ever in the Yonge/Eglington/Davisville area whether for Winterlicious/Summerlicious or even on a regular night. The Rolling Pin is a tiny bakery&cafe near the Loblaws between York Mills and Lawrence on Yonge. They sell cakes, pies, gourmet donuts, macarons and other baked goods. 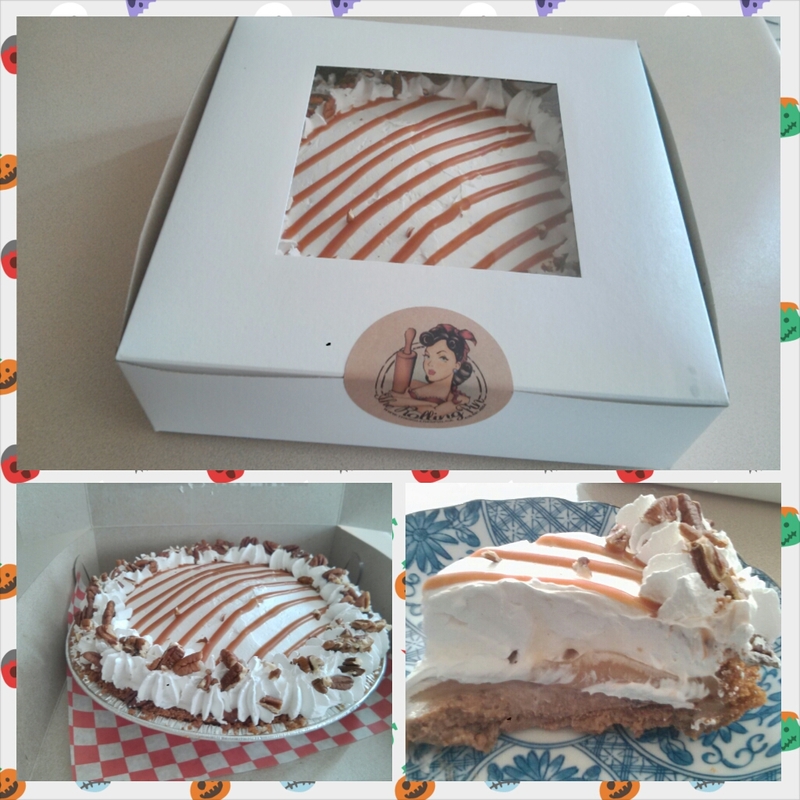 I had pre-ordered the Pecan Caramel Pumpkin Pie ($22). 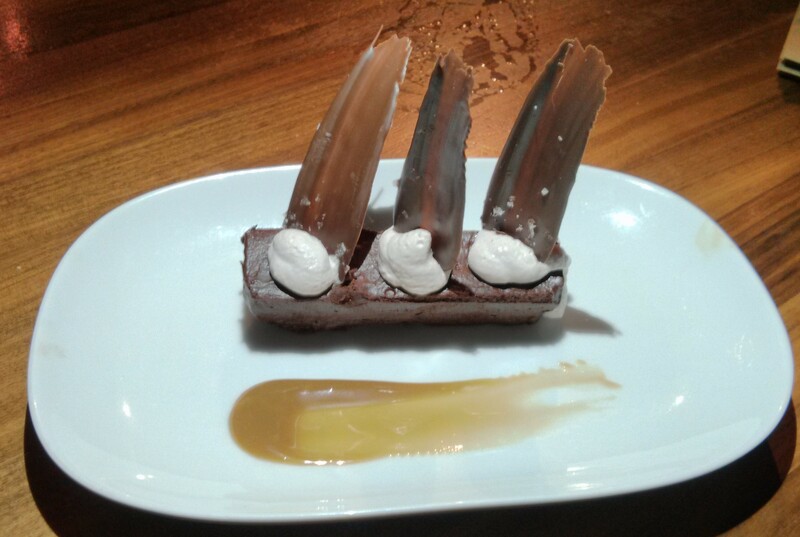 It comprises of a Graham crust, salted caramel, caramel drizzle, pumpkin filling, pecans and lots of whipped cream. On the whole, the pie is good however I didn’t like the fact that the pumpkin filling is very minimal and there’s a large layer of whipped cream. Initially when I first read pecan caramel pumpkin pie on their website I imagined combining pumpkin pie and pecan pie together. I didn’t think there would be so much whipped cream and the pecans would just be sprinkled on top of the whipped cream around the edges of the pie. I also didn’t think that the pumpkin filling would be a thin layer as opposed to the thick layer of pumpkin filling I am accustomed to for a regular pumpkin pie. Overall, I had different expectations of what the pie was suppose to be as opposed to how it actually turned out. 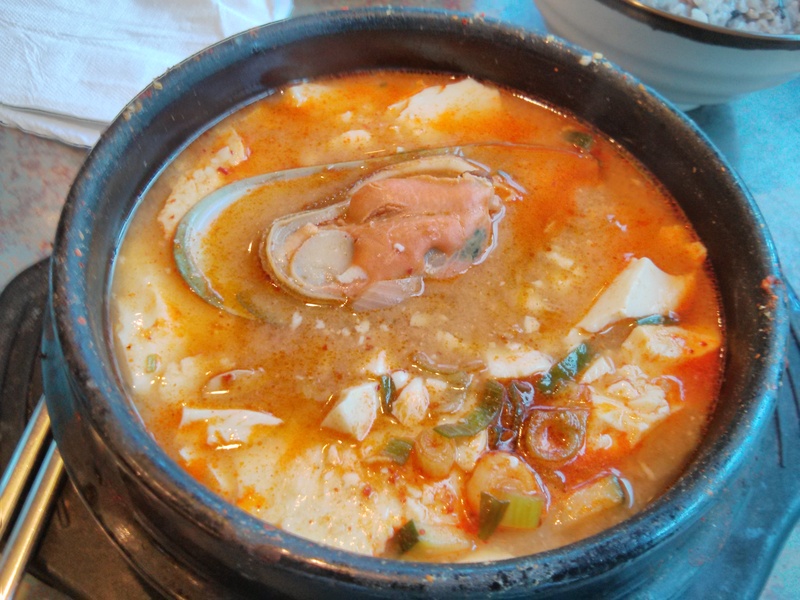 The first time I went to Symposium Cafe is in Waterloo so I was pleasantly surprised to find a branch in North York. My high school friends decided to try this cafe after hearing about me reminiscing the Waterloo location. The North York location is much smaller compared to the Waterloo location. Th Waterloo location has a much more extensive cake selection as well. What I like about Symposium Cafe is their Sunday special which is 2 cakes for the price of 1 and they have a fairly extensive drink selection. We decided to split the Bailey’s Cheesecake ($7.95) and the Fudge Brownie Cheesecake ($7.95) while another friend got the Rockslide Brownie ($5.25). 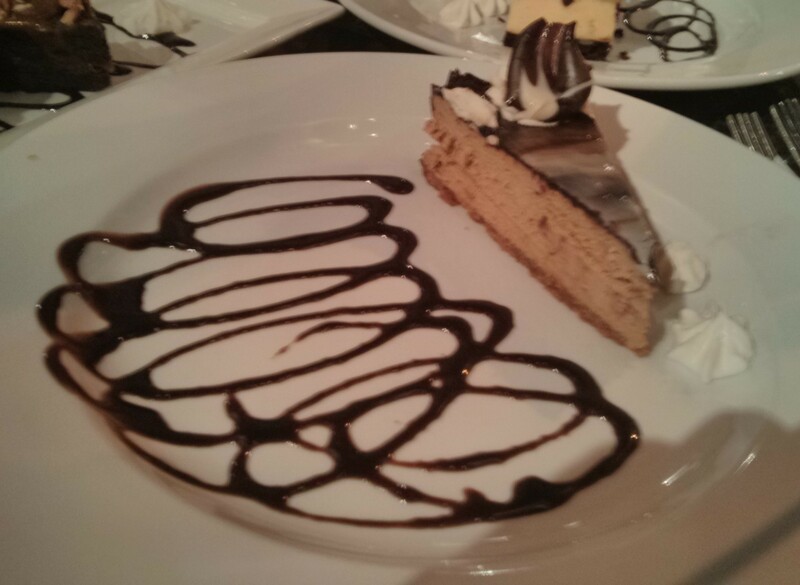 The Bailey’s Cheesecake is quite good. 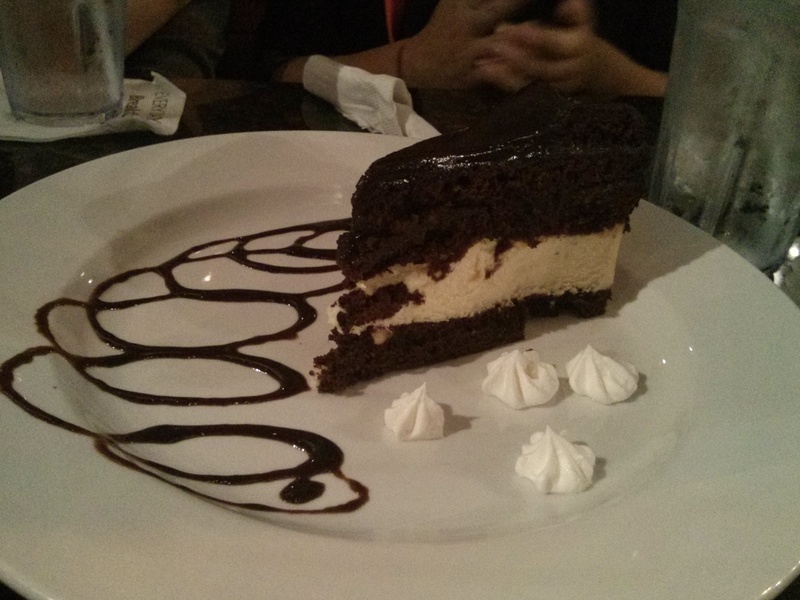 The Fudge Brownie Cheesecake is very chocolatey. Both are quite sweet. My friend enjoyed the Rockslide Brownie. 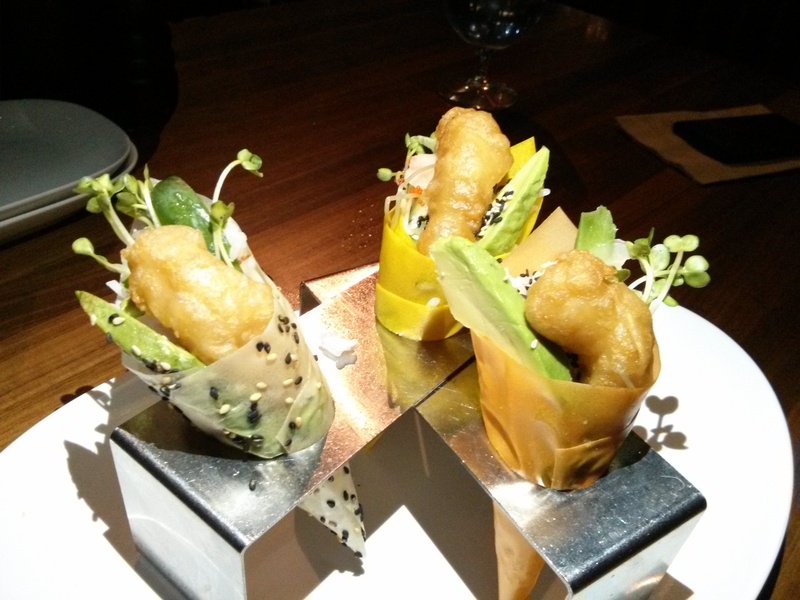 Symposium is definitely a nice restaurant for a romantic date or just hanging out with friends however it can be pricey. 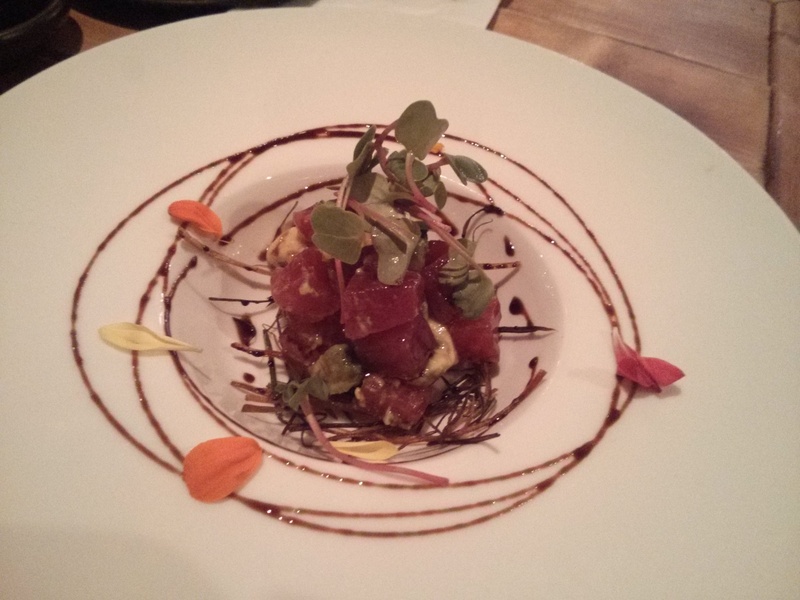 Two of my university friends and I had dinner at Five Doors North last night. 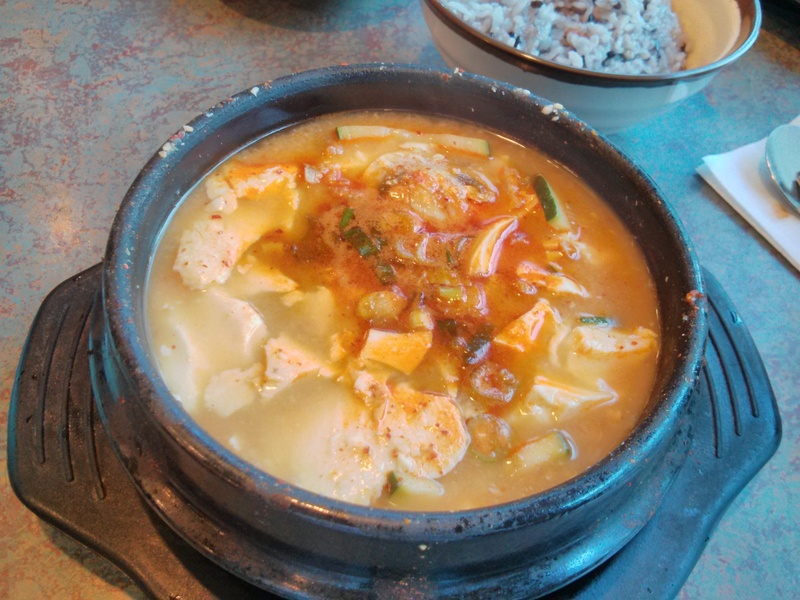 I had raved about this restaurant to one of my friends. 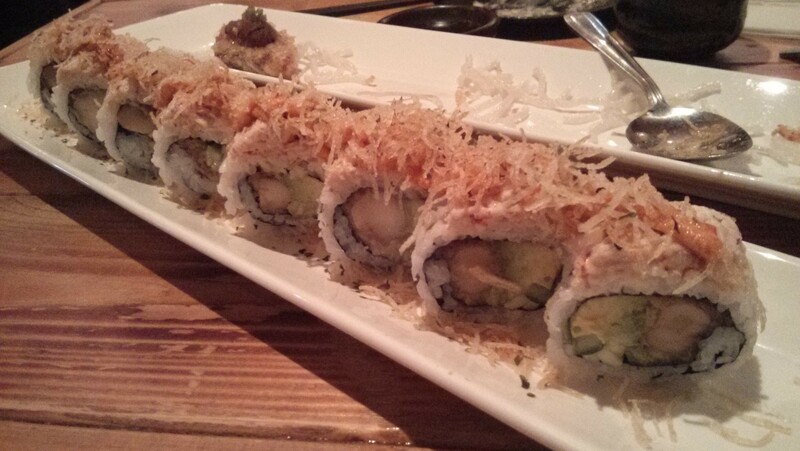 Summerlicious dinner is $25 + tax & tip. We sat near the front of the restaurant near the tiny patio out front. We had noticed that their specials included elk. 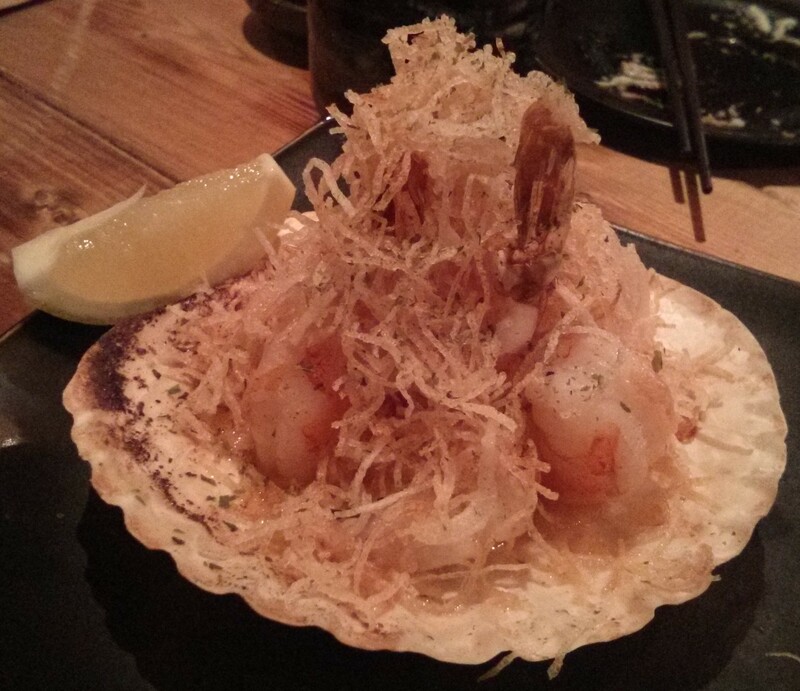 We were tempted to try the dish rather than go with the fix prixe menu. While waiting for our other friend we got the rosemary foccacia ($1/person) and a pitcher of sangria ($39.96). 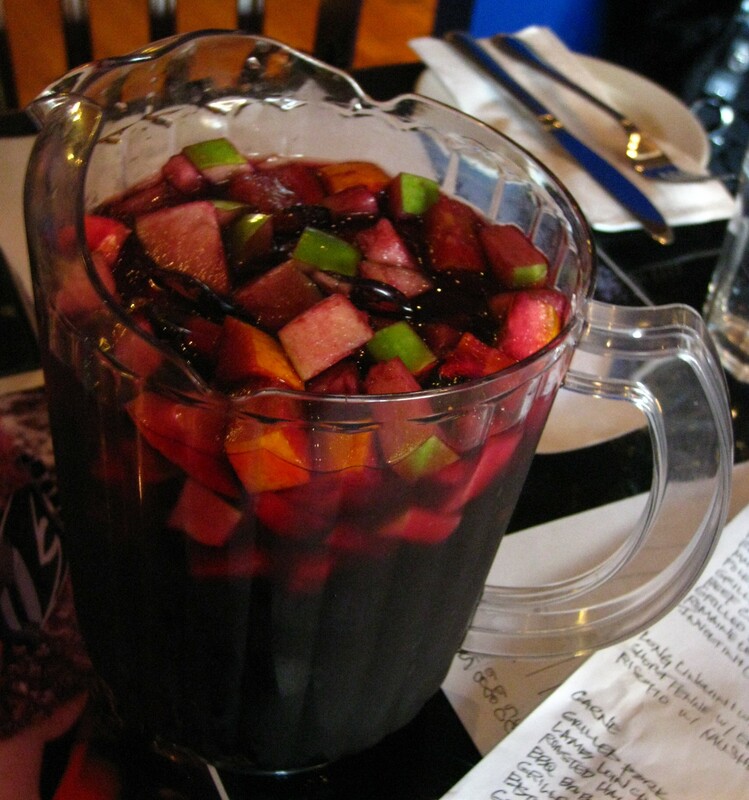 The sangria isn’t as good as the one I had in Toledo, Spain. 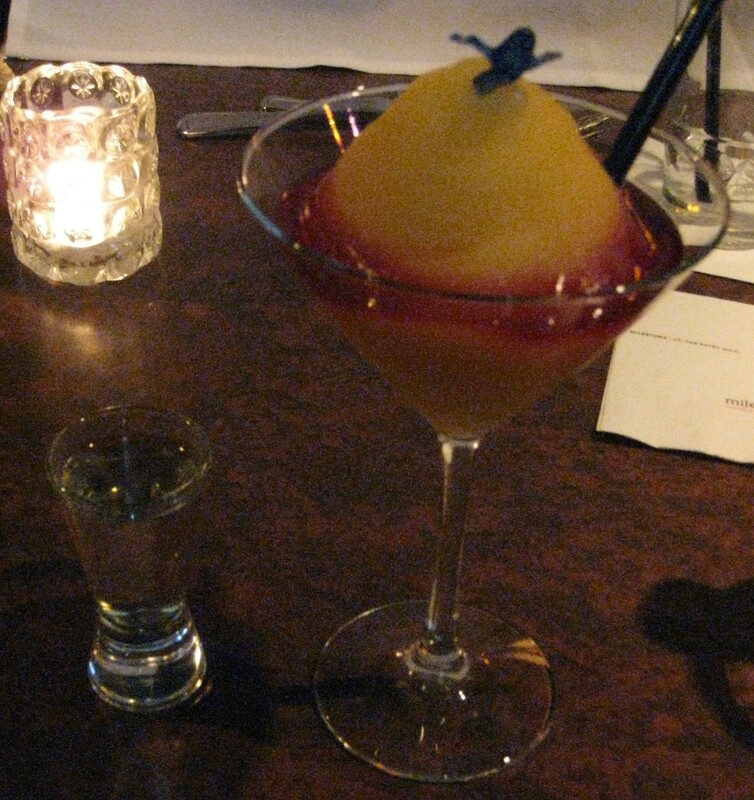 It’s not as sweet as I would have preferred it however the alcohol is quite strong. 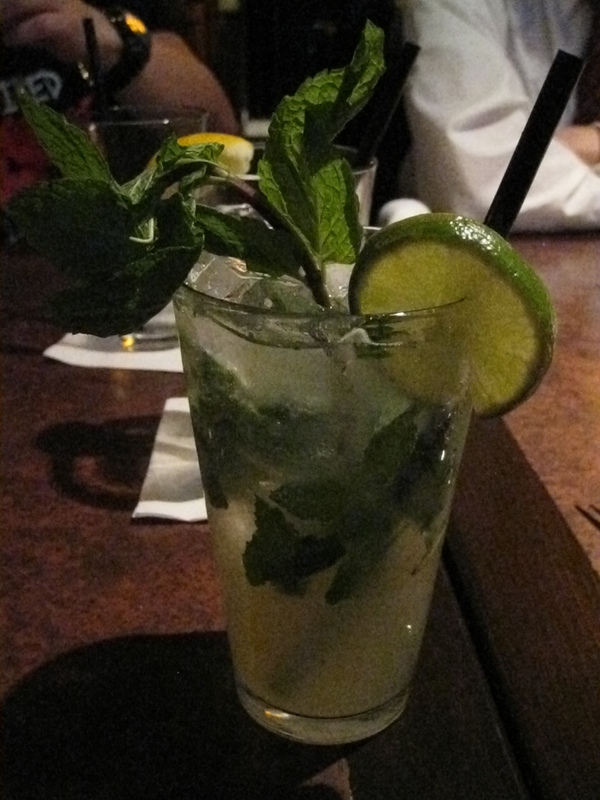 The fruits used include green apples, oranges and limes. 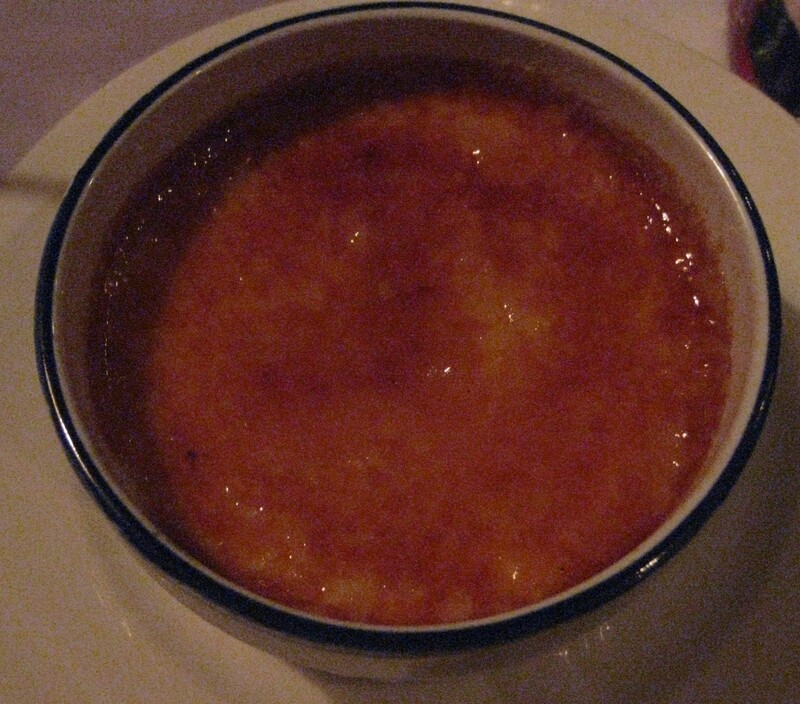 One friend ordered the baked goat cheese polenta for the appetizer, grilled black tiger shrimp roasted corn salad for the entree and creme brulee for dessert. Another friend ordered the baked goat cheese polenta for the appetizer, Miami ribs for the entree and creme brulee for dessert. I ordered the grilled asparagus salad, Miami ribs and creme brulee. I was interested in the corn, sweet potato, coconut chowder however I decided to go with salad since a friend and I were splitting a pitcher of sangria. 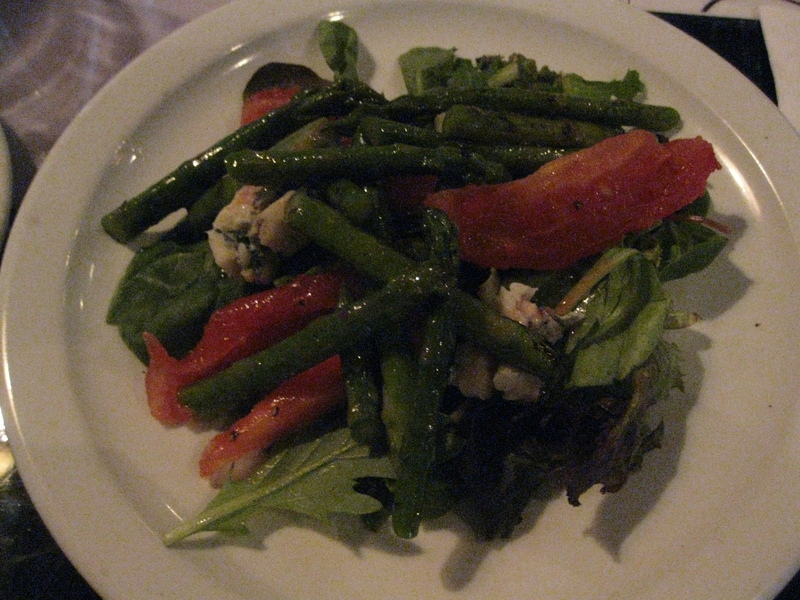 The Grilled Asparagus Salad is comprised of grilled asparagus, arugula, Olive Oil Poached Tomatoes, Gorgonzola Cheese and Chianti Vinaigrette. The grilled asparagus was tasty while the tomatoes surprised me since I expected it to be warm or cooked rather than cold since the asparagus is cooked. I never had Gorgonzola cheese before and I discovered that it has a really strong flavour since it is an Italian blue cheese. 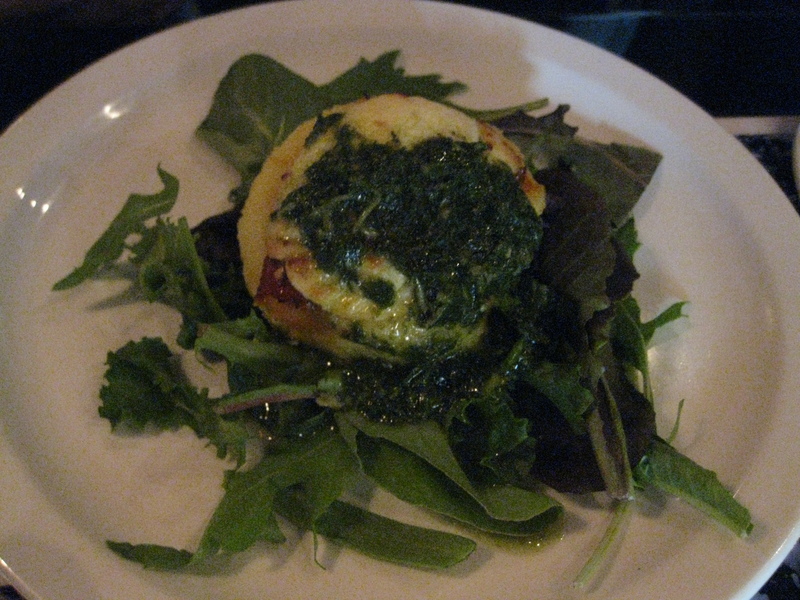 The baked goat cheese polenta is baked goat’s cheese with polenta, sundried tomato paste and pesto on a bed of arugula. One of my friends said that the sundried tomato is only on half of the polenta. Quality control for the polenta could be improved since we were all under the impression that the sundried tomatoes, like the pesto, would cover the whole area of the polenta rather than just a portion of it. 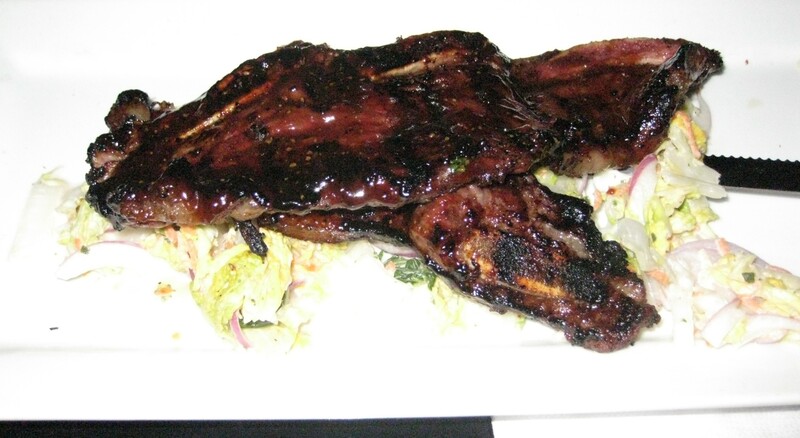 Szechuan Marinated Miami Ribs comes with coleslaw. My friend thought it was too sour while I thought the coleslaw has a strong something to it. The ribs were good albeit too charred along the edges. 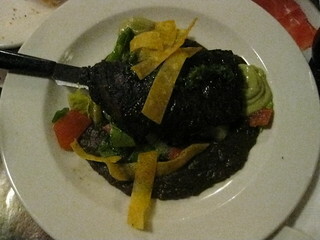 I think I prefer their baby back ribs from Winterlicious compared to the Miami ribs. 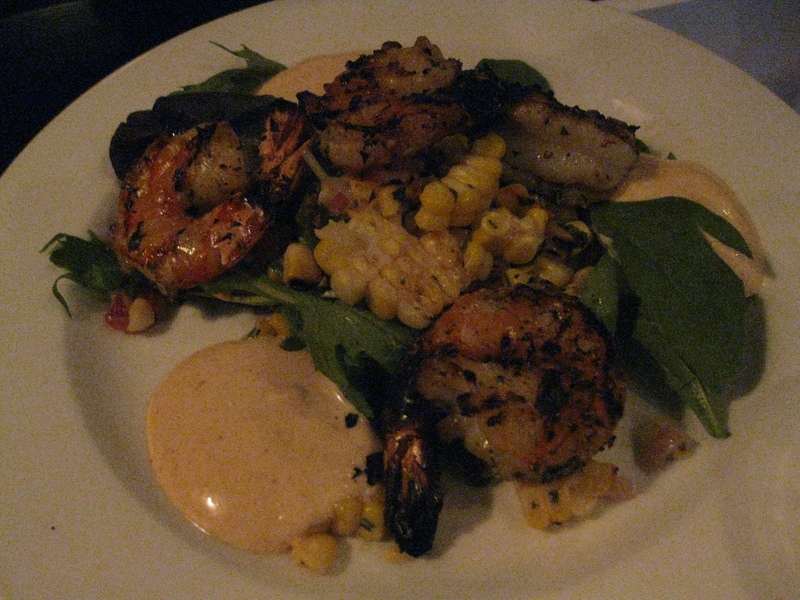 Grilled Black Tiger Shrimp Roasted Corn Salad comes with Chipotle Aioli. My friend enjoyed it. 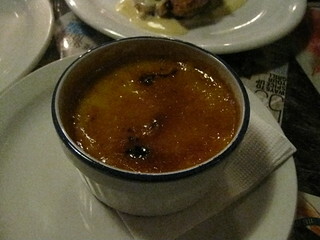 The creme brulee was delicious. The custard was nice and creamy while the top was a bit hard and crunchy. 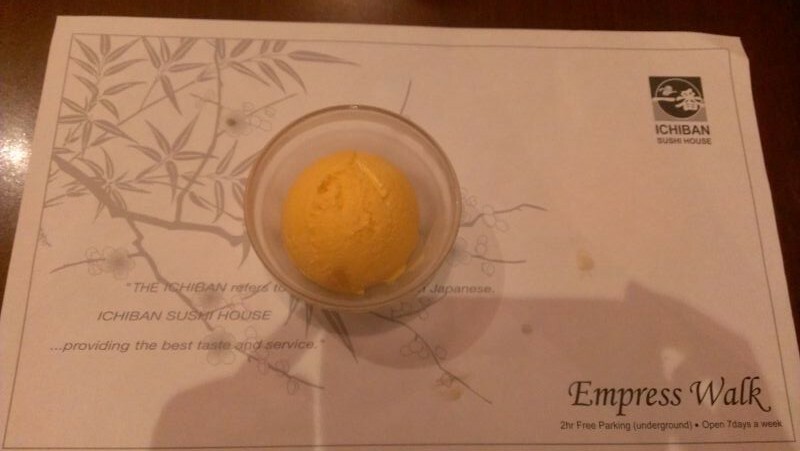 I am definitely coming back here soon to try their elk if they still offer that dish. Overall, this is becoming my favourite midtown restaurant.